Notes: This title has had at least two DVD releases and is also available on Blu-ray as part of a boxed set entitled The Masterpiece Collection. 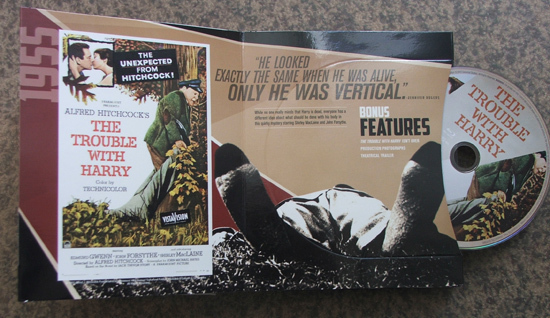 The transfer used for the boxed set is the same one that is included here and the disc includes the same special features. The artwork on the actual disc is the only thing different about this release. The Trouble With Harry was a very troubled production. Hitchcock decided to shoot the film on location, but the weather never cooperated and the acoustics in the gymnasium (where the sets were built) created unusable sound. The problems seemed to elevate when an overhead bracket supporting the enormous VistaVision camera broke and it came crashing down, nearly crushing the director. The camera merely swiped Hitchcock’s shoulder, but one of the crew members was injured in the incident. When the production fell behind schedule, Hitchcock was forced to move his production back to the more predictable confines of the Hollywood studio. 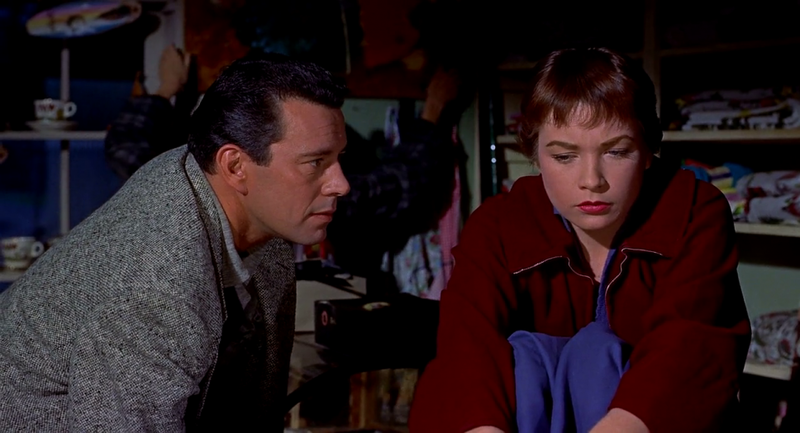 Unknown to me, there were two men in the audience of that Pajama Game performance that would change my life forever; Hal Wallis (the Hollywood producer who discovered Dean Martin and Jerry Lewis), and Doc Ericson (a representative for the legendary director, Alfred Hitchcock). 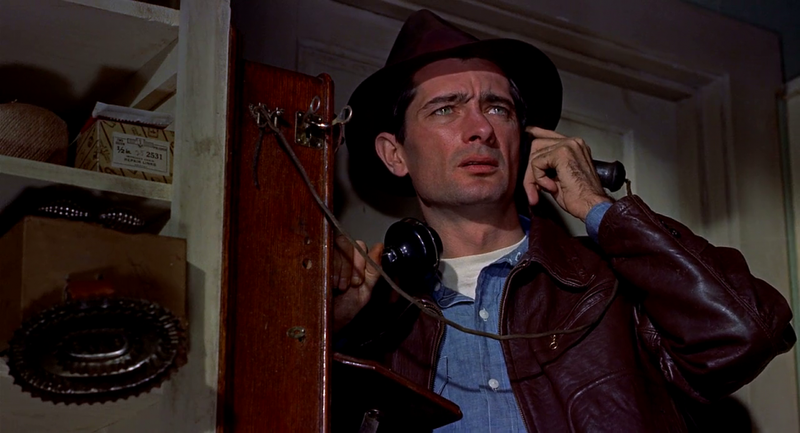 Here I was – a nineteen year old chorus girl, with no acting experience, [and] Hitchcock put me in a room with Mildred Natwick, Edmund Gwenn and John Forsythe. These were the premiere actors on Broadway and now were my co-stars. We were together during the first reading and having no previous experience, I just read it instinctively. When we were finished, Hitch, in his quirky sense of humor, said, ‘You have the guts of a bank robber.’ Because of Hitch’s reputation, I knew I had the job! I was scared, but curious, and yearned for the learning experience as I joined the film crew in Vermont. I have fond memories of all the cast. 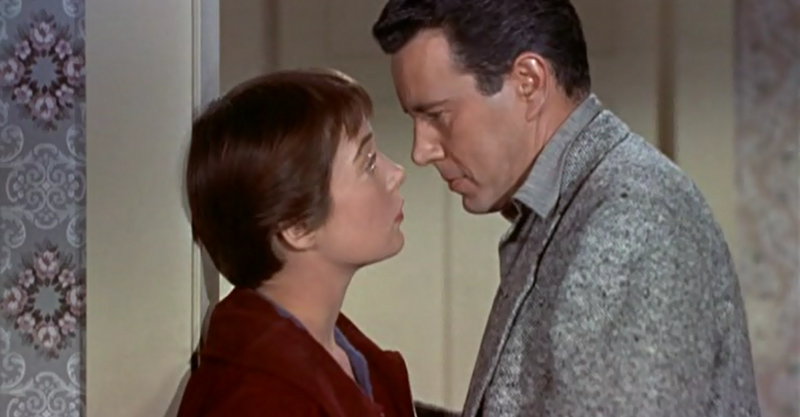 In the beginning John Forsythe tolerated me as an amateur, but then realized I had an instinct for acting and started to appreciate this gift. I learned so much from all of them. Hitchcock was a connoisseur of food and had great knowledge in this area. We shot in Vermont because the hotel we stayed in, The Lodge, was famous for the best food in Stowe, Vermont. He liked the leaves of Vermont, but he really appreciated the food. There was always plenty on the set and I ate all of it because it was free. In my days as a chorus girl I hadn’t had much to eat. I existed on graham crackers and peanut butter. When I began the picture I was svelte and lithe, but by the time I buried Harry for the last time, the head of the studio called me… I think the word was blimp. Hitch had a mind-tease code that kept you alert. One morning he came waddling toward me, eyes twinkling, roly-poly stomach well out in the lead. …The orchestral specification is modest: double wind, four horns, harp and strings. As was his usual custom he uses the orchestra in smaller groupings selecting a color from his palette to match mood and image. Unfortunately, the film wasn’t very successful at the box office. Alfred Hitchcock speculated that the film was improperly marketed to the public. This might very well be the case. In an article about Jerry Pickman (a publicist at Paramount), Pickman admits that he didn’t think that the studio would be able to market the film. Today, this seems like an unfair analysis. A recent review published in The Guardian labeled the film a “masterpiece.” I disagree with this statement, but the film is certainly on par with other comedies of the period and better than most of them. It stands out as a decidedly unusual film in the director’s canon and has earned the admiration that it now receives from cinemaphiles. 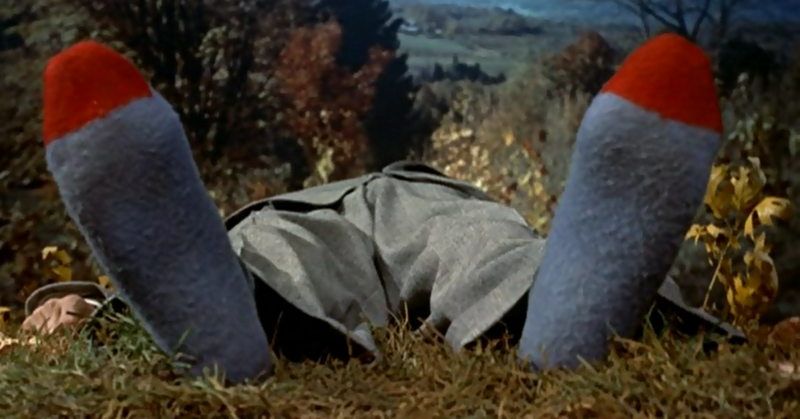 Universal’s 1080P transfer of The Trouble with Harry is really surprisingly beautiful. Robert Burks’ autumn landscapes are vivid and accurate and viewers will see detail and clarity never before observed on any previous home video format. Contrast is perfectly rendered with deep black levels and the source print is nearly immaculate. While grain is certainly apparent, this is inherent in the film’s celluloid source and contributes to a more cinematic experience. It is actually rather difficult to find something to complain about. I suppose that some might complain about the lack of a 5.1 mix, but the 2.0 English Mono DTS-HD Master Audio is accurate and a vast improvement over those included on previous home video releases. There is no perceptible hiss present and the track seems to be free from other annoying signs of age as well. Dialogue is consistent and always intelligible and Bernard Herrmann’s music has more room to breath due to the lossless nature of this track. For one to expect anything better than this seems rather unreasonable. All of the supplementary materials from the DVD releases have been ported over to this Blu-ray disc. Laurent Bouzereau’s documentary on the making of The Trouble With Harry is a delightful look into the making of this often overlooked film. 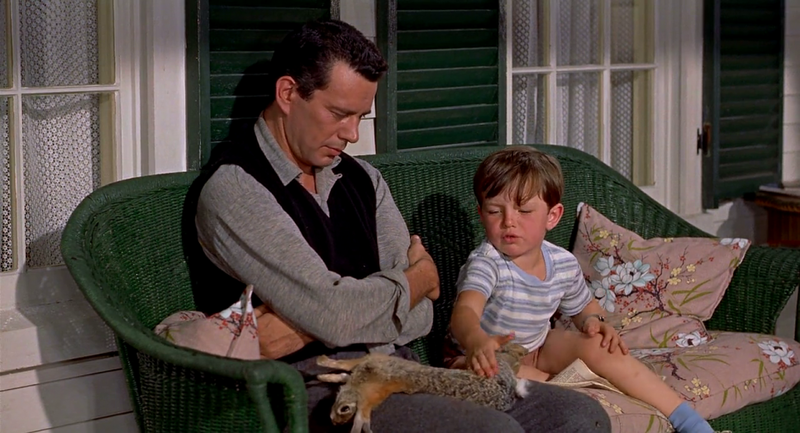 John Forsythe, John Michael Hayes, Herbert Coleman, Patricia Hitchcock, and Steven Smith (Bernard Herrmann’s Biographer) discuss the production. This photo gallery plays by itself as a sort of slide show, but there is the option of skipping to the next photo. The trouble with the “Theatrical Trailer” on this disc is that it is not an actual Trailer. It is merely a promo for the VHS release of the film. This is a shame. It would have been interesting to see how Paramount chose to market this unique film. 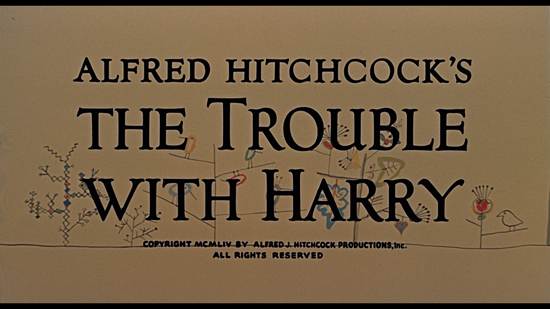 The Trouble with Harry has been given an amazing Blu-ray release. I would recommend adding it to your collection.